Renewable energy subsidies increased by 186 percent from $5.1 billion to $14.7 billion. Renewables saw by far the largest jump in federal benefits. Of the $14.7 billion in fiscal year 2010, $6.2 billion (65 percent of the increase) was related to the Obama administration’s economic stimulus law. Wind led the various renewables with a more than 10-fold increase in subsidy from $476 million to $4,986 million. Solar subsidies increased by more than a factor of 6 from $179 million to $1,134 million and led the electricity sector subsidies on a unit of production basis. Subsidies for biofuels increased by 66 percent, from $4 billion to $6.6 billion. Conservation and end-use subsidies more than tripled from $4 billion to $14.8 billion. Conservation subsidies increased from $369 million to $6,597 million, a factor of almost 18. End-use subsidies increased from $3,618 million to $8,241 million, more than a doubling. Federal subsidies for coal increased 44 percent from $943 million to $1,358 million. Federal subsidies for oil and natural gas increased 40 percent from $2,010 million to $2,820 million. Federal subsidies for nuclear energy increased 46 percent from $1,714 million to $2,499 million. The focus of the congressional request was on subsidies for electricity generation, both on a total dollar amount and on the amount per unit of electricity production. From 2007 to 2010, federal subsidies for electricity production increased from $6,582 million to $10,902 million, an increase of 66 percent. The largest dollar amounts went to wind and nuclear. But, on a unit of production basis, the winners were clearly wind and solar. Absent from this report is an accounting of subsidies by unit of production, which the previous report released by EIA in 2008 contained. [ii] In the 2011 report, EIA states “while the overall amount of federal subsidies and support provided per unit of overall energy consumption or production has clearly grown, simply dividing the current value of subsidies by current consumption or production does not reflect either the long-term impact of the imbedded subsidies and or the future impacts of current subsidies and support that may only be starting to impact energy markets.” While whatever this statement is meant to imply may be true, these measures are another indicator of how federal dollars are being used and the value the nation is getting from them. It is interesting that the same upper management in EIA that thought that the amount expended divided by the amount produced was an appropriate indicator three years ago, no longer believes it should be reported now even though that information was requested by congress. EIA does state that “Relative to their share of total electricity generation, renewables received a large share of direct federal subsidies and support in FY 2010. For example, renewable fuels accounted for 10.3 percent of total generation, while they received 55.3 percent of federal subsidies and support.” While this statement is true, the difference is skewed much more than presented by these statistics because hydroelectric power provides the largest share of renewable generation (about 60 percent), but got only 0.6 percent of all subsidies and 1.5 percent of all renewable subsidies. The Institute for Energy Research decided to calculate the federal subsidies and support per unit of electricity production from the information provided in EIA’s report and the generation data in its Monthly Energy Review. [iii] The ratio of dollars to production is given in the following figure. As can be seen by the figure, solar is being subsidized by over 1200 times more than coal and oil and natural gas electricity production, and wind is being subsidized over 80 times more than the more conventional fossil fuels on a unit of production basis. Biofuels, including ethanol, received $7,646 million in federal subsidies and support in fiscal year 2010, more than double its $3,249 million received in FY 2007, and the largest component of non-electricity production subsidies (73.2 percent). This translates into a unit of production subsidy of $7.09 per million Btu, over 15 percent higher than in FY 2007. Biofuels received 3.5 times more federal support than natural gas and petroleum liquids did in fiscal year 2010. 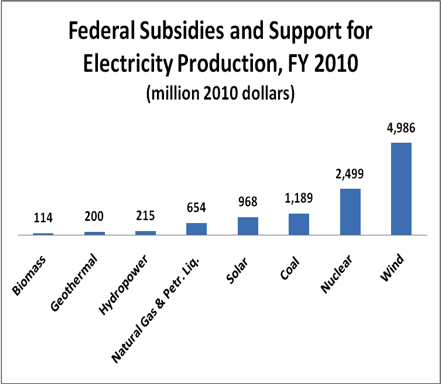 Federal subsidies and support for natural gas and liquids in the non-electricity production sector totaled $2,165 million in fiscal year 2010, about 20 percent of the non-electricity sector subsidies and support. On a consumption basis, natural gas and petroleum liquids subsidies in fiscal year 2010 were $0.04 per million Btu based on non-electricity consumption. This was the metric used in EIA’s 2008 report. On a production basis, natural gas and petroleum liquids subsidies in fiscal year 2010 were $0.07 per million Btu, excluding the domestic share of natural gas and oil consumed by electric generating plants. In either case, subsidies for biofuels in fiscal year 2010 were over 100 times more on a Btu basis than those for petroleum and natural gas. 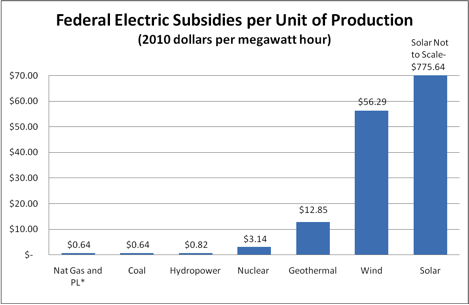 EIA’s report shows that on a total dollar basis, wind energy has the highest federal subsidy. However, on a unit of production basis, solar energy is by far the costliest form of electricity production. Both of these technologies are being promoted by the Obama Administration and many environmentalists in lieu of the more cost effective fossil fuels. Also, one thing that bears investigation is why EIA did not include the amount of federal subsidies and support provided per unit of overall energy consumption as it had in its previous report.